After exploring the handsome blue suit worn by Sean Connery in that most parodied of 007 flicks, You Only Live Twice, BAMF Style is continuing its theme of debonair international spies in blue suits with a look at Jean Dujardin’s tailored suit in OSS 117: Cairo, Nest of Spies. Michel Hazanavicius’ comic reboot of the OSS 117 character also meant a re-identification. In both Jean Bruce’s original novels and its subsequent “serious” cinematic adaptations, Hubert Bonisseur de La Bath was an American agent who graduated from the wartime OSS to the CIA and NSC. The OSS 117 of Hazanavicius’ films retains his character’s name and codename but reimagines him as a quintessentially French secret agent in service of the Service de Documentation Extérieure et de Contre-Espionnage (SDECE). OSS 117: Cairo, Nest of Spies is probably the most fun I’ve ever had in another language. The film parodies both the original OSS 117 series of the ’50s and ’60s as well as Sean Connery’s James Bond and the multitude of Eurospy flicks inspired by the 007 phenomenon although its style and tone are more like a live-action (and French!) Archer than traditional Bond. 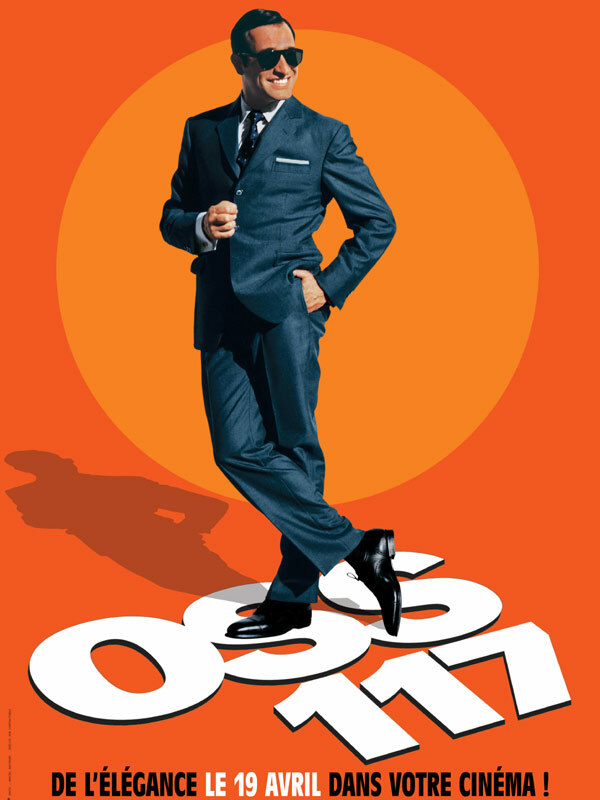 As far as spy comedies go, OSS 117 is wisely more along the comedic lines of the witty and smart Kingsman: The Secret Service than the flat and family-friendly Get Smart adaptation. For much of his action in Cairo, Hubert wears a rich marine blue suit in a lightweight wool or a wool-mohair blend, suggested by the suiting’s distinct sheen under certain light. Jean Dujardin’s wardrobe in the film was made by Joseph Kergoat, a Paris tailor who coincidentally began his career around the time of the film’s setting in 1955. OSS 117 hams it up in a suit beautifully tailored for the occasion. The three buttons on the front and the three buttons on each cuff are navy plastic to coordinate with the cyanic suit. The soft shoulders, single vent, and less shaped structure of the jacket is more evocative of the American sack cut than a European suit. The straight hip pockets have flaps, and Hubert wears a neatly folded white linen pocket square in the jacket’s welted breast pocket. The boxy fit and Hubert’s decision to wear the top two of his three buttons fastened lends him the square appearance of a “super G-man” of the 1950s. The flat front trousers have a lower rise than one would have found on a genuine 1950s suit. In addition to the straight side pockets along the side seams, there is a jetted pocket on the back right. The legs gently taper down to plain-hemmed bottoms. Hubert wears a black leather belt with a steel single-prong square buckle. OSS 117 hangs out in Cairo. Beneath his suit, Hubert wears a Bond-style shoulder holster with a light brown suede harness under his left armpit and a black leather strap that crosses over his right shoulder. Hubert’s white cotton shirt has a spread collar with a front placket and double (French) cuffs, in which our hero wears a set of gold keystone-shaped cuff links. Each link consists of four gold bars that slightly taper in length to form a keystone shape, bisected by a single gold bar. A shaken and stirred OSS 117 recovers after his latest misadventure. Hubert wears two slim silk neckties, both with subtle patterns that prominently incorporate navy to coordinate with his rich blue suit. His first tie is solid navy with muted gray pin dots. Hubert confers with Larima (Bérénice Bejo). Later in the film, Hubert wears the same outfit with a blue-on-black jacquard silk tie. OSS 117 is confronted by a revolver-wielding Raymond Pelletier. Hubert wears a pair of black calf leather semi-brogue oxfords with a medallion-punched cap toe, bal-type closed lacing with tive eyelets, and black leather soles. His socks are also black. Hubert Bonisseur de La Bath manages to step in and out of trouble with ease. The watch that Jean Dujardin wears on screen has been identified as a Tissot Heritage 150 Chronograph, one of a limited run manufactured to celebrate Tissot’s 150th anniversary in 2003. Inspired by a 1946 Tissot design, this stunning and classic chronograph has a light silver dial with three sub-dials at 9:00, 3:00, and 6:00 with a date window between the latter two. With its gleaming 39.5mm stainless steel case and dark brown alligator leather band, Dujardin is almost certainly wearing the T66.1.712.31 model. This Tissot Heritage 150 would have originally sold for $3,300; the T66.1.712.31 is currently available from official retailers like Times Circle for just shy of $3,000. The total run of the Tissot Heritage 150 was 10,891: 8,888 stainless, 1,853 gold, and 150 platinum. French promotional art for OSS 117: Cairo, Nest of Spies that features Hubert’s blue suit. 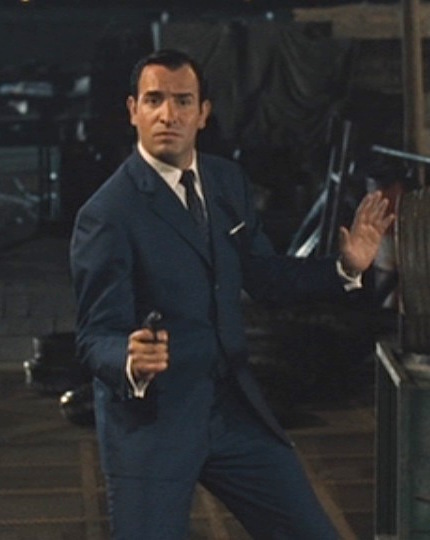 OSS 117 carries a Walther PP, the original and slightly larger pistol that would be developed into the PPK and famously carried by James Bond. Like all the best bumbling spies, OSS 117 finds himself at the point of his own gun by the end of the story. Like its more famous variant, the Walther PP is a blowback semi-automatic pistol primarily chambered to fire .32 ACP (7.65x17mm) or .380 ACP (9x17mm) ammunition, carrying an extra round of each over the PPK. It was introduced in 1929 as the Polizeipistole (get it?) and quickly grew in popularity among European police forces, including France. The German disarmament after World War II meant that Walther had to look beyond its German borders. In 1952, Walther licensed production of the PP series of pistols to Manufacture de Machines du Haut-Rhin (Manurhin) in 1952, and all European-made PP series pistols manufactured between that time and 1986 were made at the Manurhin factory in Alsace. To think I almost let you make love to me! What a fine mess! Thank you very much for this amazing post! I think I was at least one of the people who suggested this outfit to you quite a while ago and it’s very nice to now see it detailed so beautifully. Keep up the good work, I am looking forward to many more posts about OSS 117, James Bond and The Man from UNCLE! Best regards from Germany! P.S. Hubert’s shoes are the Crockett and Jones Selborne! Thank you! I appreciate that very much. Let me know if there’s ever any posts you’d like to see in particular.